Popular puzzle game Angry Birds is all dressed up for All Hallows' Eve. Nothing quite says "Halloween" like smashing pumpkins, green pigs in ghost costumes and birds flying through the air. Trick or treat! Angry Birds is a physics-based puzzle game for Apple's iOS in which birds are trying to recover stolen eggs, and Angry Birds: Halloween Special Edition is a holiday version with 45 new stages. The goal is the same: fling birds to smash the green pigs that hide on or under make-shift structures. As with the original, birds differing in speed, size, weight and power are used to penetrate a variety of structural materials that include rock and wood. Some of the birds have special attacks and can speed up in mid-flight or can drop eggs when players tap the touch screen. Fittingly, the Halloween version has spooky noises and Halloween trimmings like jack-o'-lantern and a glowing harvest moon. The pumpkins, however, aren't only window-dressing as it's possible to pick up extra points by destroying the newly added gourds. The person who cannot let go of Halloween, which is over. However, this game is geared for those who have played the original Angry Birds and less so for newcomers. Angry Birds is a huge hit and resides at the top of the Apple App Store charts. Million upon millions of people love this game! I've never played Angry Birds before. Is Angry Birds: Halloween Special Edition a good place to start? I'd never played it, either. I started with Angry Birds: Halloween Special Edition and went back and played the original Angry Birds. The Halloween version is geared towards seasoned players, and the difficulty curve ramps up quick. Players are not eased into the more difficult puzzles as with the original game, but chucked into them. To answer your question, no. Pumpkins provide added pig protection. Speaking of the original game, how is Angry Birds: Halloween Special Edition different? The basic game mechanic is the same. However, the Angry Birds: Halloween Special Edition lacks the original's color variation for the various stage backgrounds. The game's background is largely the same (it is night), causing many of the stages to blur into each other. But there are nice touches, such as the pigs wear pumpkin helmets. The addition of pumpkins is one thing that's more than simply cosmetics as small pumpkins are worth 500 points and jack-o'-lanterns are 3000 points. And you just thought they were good for pie. You said it is a difficult game. How difficult? If you've played Angry Birds before, you should be fine. The difficulty cranks up pretty quick around the 8th or 9th stage. Unfortunately, Angry Birds: Halloween Special Edition does not let players skip ahead: Each stage much be played through in order. The ability to play tricky stages later would be appreciated! The game feels more like a straight-up Angry Birds continuation than a spin-off or stand alone title. Don't pick up Angry Birds: Halloween Special Edition if you haven't played through the entire original game. It's priced the same ($0.99) and features less content. Get the original — it's great. Angry Birds: Halloween Special Edition is the embodiment of Halloween: You'll put on a costume on the 31st, but you probably don't want to wear it in March. 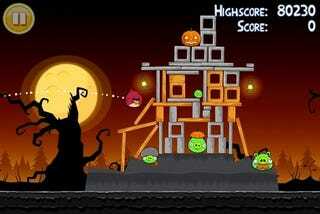 Angry Birds: Halloween Special Edition was developed and published by Rovio Mobile for iOS, released on October 21. Currently priced at $0.99 and $1.99 for the HD version. A copy of the game was purchased by Kotaku for reviewing purposes. Completed all 45 stages.